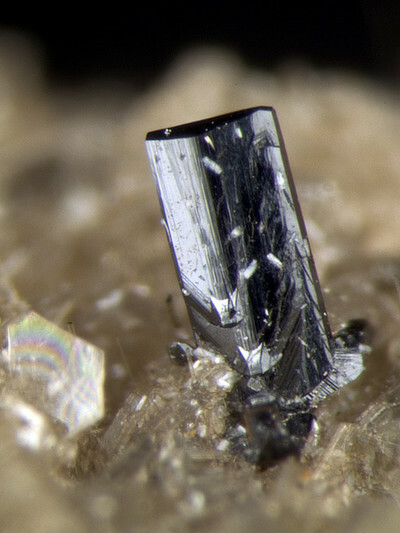 Columbite-(Fe): Mineral information, data and localities. 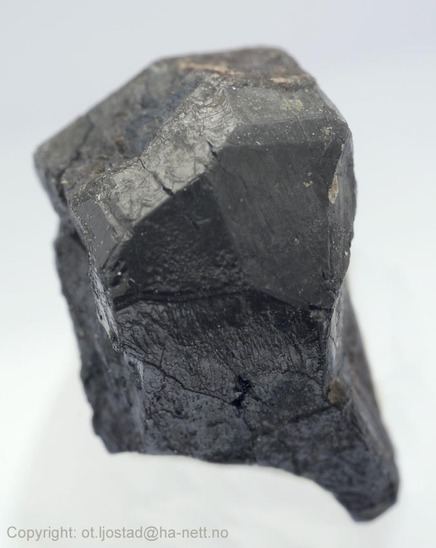 Columbite-(Fe)-Tantalite-(Fe) Series and the Columbite-(Fe)-Columbite-(Mn) Series. Formerly known as columbite and ferrocolumbite. Reddish brown in transmitted light. Atagoyama, Fukushima, Japan Matsubara, S., Miyawaki, R., Yokoyama, K., Momma, K., Shigeoka, M., and Hashimoto, E. (2013) Pyrochlore and microlite in a pegmatite at Atagoyama, Koriyama City, Fukushima Prefecture, Japan. Bulletin of the National Museum of Nature and Science, Ser. C, 39, 1–6. Albite 42 photos of Columbite-(Fe) associated with Albite on mindat.org. Samarskite-(Y) 25 photos of Columbite-(Fe) associated with Samarskite-(Y) on mindat.org. Spessartine 16 photos of Columbite-(Fe) associated with Spessartine on mindat.org. Uraninite 14 photos of Columbite-(Fe) associated with Uraninite on mindat.org. Muscovite 13 photos of Columbite-(Fe) associated with Muscovite on mindat.org. Aquamarine 11 photos of Columbite-(Fe) associated with Aquamarine on mindat.org. Zircon 10 photos of Columbite-(Fe) associated with Zircon on mindat.org. Fluorapatite 10 photos of Columbite-(Fe) associated with Fluorapatite on mindat.org. Beryl 10 photos of Columbite-(Fe) associated with Beryl on mindat.org. Microcline 8 photos of Columbite-(Fe) associated with Microcline on mindat.org. Hatchett, Charles (1801) ) An Analysis of a Mineral Substance from North America, Containing a Metal Hitherto Unknown, Philosophical Transactions of the Royal Society of London. 92: 49–66. William P. Griffith and Peter J. T. Morris (2003). Charles Hatchett FRS (1765-1847), Chemist and Discoverer of Niobium". Notes and Records of the Royal Society of London. 57 (3): 299. E. J. Kinast, O. Isnard, J. B. M. da Cunha, M. A. Z. de Vasconcellos and C. A. dos Santos (2011): A new approach for the determination of multiple cation locations and ordering, using the example of natural and heat-treated columbites. Journal of Applied Crystallography, 44, 738-746. The following Columbite-(Fe) specimens are currently listed for sale on minfind.com. American Mineralogist (1978): 53: 416-431; Černý, P., Galliski, M. A., Oyarzábal, J. C., Teertstra, D. K., Chapman, R., MacBride, L., & Ferreira, K. (2003). Stranded and equilibrated assemblages of late feldspars in two granitic pegmatites in the Pampean Ranges, Argentina. The Canadian Mineralogist, 41(4), 1013-1026. Franchini, M., Lira, R., Meinert, L., Ríos, F. J., Poklepovic, M. F., Impiccini, A., & Millone, H. A. (2005). Na-Fe-Ca Alteration and LREE (Th-Nb) Mineralization in Marble and Granitoids of Sierra de Sumampa, Santiago del Estero, Argentina. Economic Geology, 100(4), 733-764. Western Australian Mines Department (1947), Report of the Department of Mines for the Year 1947, Western Australian State Government 1947. Jacobson, M.I. (1997) The Coolgardie Pegmatite Field. Australian Journal of Mineralogy 3:2, p.95. ⓘ Kempton Brothers Beryl Mine (Arthur River South pegmatite; Tobin Well pegmatite; Marloo No2 pegmatite; Marloo Well No2 pegmatite) ? 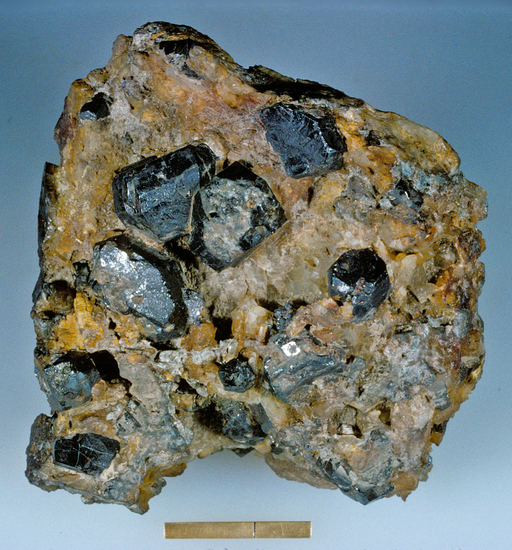 G. Niedermayr, I. Praetzel: Mineralien Kärntens, 1995; Černý et al (1989), Mineralogy and Petrology: 40: 197-206. Carinthia II (2012); Auer, Ch., Kolitsch, U., Bernhard, F. & Brandstätter, F. (2012): 1732) Arsenopyrit, Columbit-(Fe), Graphit, Ludlamit und gediegen Wismut vom Pegmatit beim Laggerhof, Millstätter Seerücken, Kärnten. Pp. 136-137 in Niedermayr, G. et al. (2012): Neue Mineralfunde aus Österreich LXI. Carinthia II, 202./122., 123-180. Kolitsch, U. (2018): 2092) Columbit-(Fe) und Spessartin vom Doppelbachgraben bei Maiersch, Waldviertel, Niederösterreich. Pp. 230-231 in Walter, F. et al. (2018): Neue Mineralfunde aus Österreich LXVII. Carinthia II, 208./128., 185-254. Kolitsch, U. (2016): 1980) Columbit-(Fe) von Weiterndorf bei Weiten, Waldviertel, Niederösterreich. P. 226 in Walter, F. et al. (2016): Neue Mineralfunde aus Österreich LXV. Carinthia II, 206./126., 203-250. Revista Brasileira de Geociências 21(1):34-40 (1991). Leonardo, O. H. 1936, Tantalo, Niobio, Uranio e Radio no Brasil. Josef Vajdak (Peque Rare Minerals) specimens (JV02/101-4), labelled "Golconda/Urbano mine". dan weinrich; Proctor, K. (1984). Gem pegmatites of Minas Gerais, Brazil: exploration, occurrence, and aquamarine deposits. Gems and Gemology, 20(2), 78-100. Beurlen, H., Da Silva, M.R.R., Thomas, R., Soares, D.R., and Olivier, P. (2008): Mineralium Deposita 43, 207-228; Beurlen, H., Thomas, R., Melgarejo, J. C., Da Silva, J. M. R., Rhede, D., Soares, D. R., & Da Silva, M. R. (2013). Chrysoberyl-sillimanite association from the Roncadeira pegmatite, Borborema Province, Brazil: implications for gemstone exploration. Journal of GEOsciences, 58(2), 79-90. Baumgartner et al (2006), Canadian Mineralogist: 44: 69-86. Melcher, F., Graupner, T., Gäbler, H. E., Sitnikova, M., Henjes-Kunst, F., Oberthür, T., ... & Dewaele, S. (2015). Tantalum–(niobium–tin) mineralisation in African pegmatites and rare metal granites: Constraints from Ta–Nb oxide mineralogy, geochemistry and U–Pb geochronology. Ore Geology Reviews, 64, 667-719. Chakhmouradian, A. R., Reguir, E. P., Kressall, R. D., Crozier, J., Pisiak, L. K., Sidhu, R., & Yang, P. (2015). Carbonatite-hosted niobium deposit at Aley, northern British Columbia (Canada): Mineralogy, geochemistry and petrogenesis. Ore Geology Reviews, 64, 642-666. Emma R. Sheard, Anthony E. Williams-Jones, Martin Heiligmann, Chris Pederson and David L. Trueman (2012) Controls on the concentration of zirconium, niobium, and the rare earth elements in the Thor Lake rare metal deposit, Northwest Territories, Canada. Economic Geology and the Bulletin of the Society of Economic Geologists(January 2012), 107(1):81-104; D. Robert Pinckston, Dorian G. W. Smith (1995) Mineralogy of the Lake zone, Thor Lake rare-metals deposit, N.W.T., Canada. Canadian Journal of Earth Sciences, 32:516-532; SHEARD, E.R., WILLIAMS-JONES, A.E., HEILIGMANN, M., PEDERSON, C. AND TRUEMAN, D.L. (2012) Controls on the concentration of zirconium, niobium, and the rare earth elements in the Thor Lake rare metal deposit, Northwest Territories, Canada. Economic Geology, 107(1), 81-104. Anderson, M. O., Lentz, D. R., McFarlane, C. R., & Falck, H. (2013). A geological, geochemical and textural study of an LCT pegmatite: implications for the magmatic versus metasomatic origin of Nb-Ta mineralization in the Moose II pegmatite, Northwest Territories, Canada. Journal of GEOsciences, 58(4), 299-320. Wise, M. and Cerny, P., 1990, Beusite-Triphylite Intergrowths from theYellowknife Pegmatite Field, Northwest Territories, Canadian Mineralogist, v. 28: 133-139. Taylor, R.P., and Henham, R. (2001): Exploration and Mining Geology 10(1/2), 85-93. Josef Vajdak (2008) Mineral News, 24, #3, 15. HORVÁTH, L., PFENNINGER HORVÁTH, E. (2000) I minerali di Mont-Saint-Hilaire (Québec, Canada) Rivista Mineralogica Italiana, XXIV, 140-202 (in Italian with English summary). Laferrière, A. (2011) Technical Report Mineral Resource Estimation Eldor Property – Ashram Deposit Nunavik, Quebec Commerce Resources Corporation. SGS Canada Inc. 99 p.
Can Rao, Rucheng Wang, Huan Hu, and Wenlan Zhan (2009): Canadian Mineralogist 47(5), 1195-1212. Smith, B., Smith, C., Liu, G., and Ottens, B. (2005): Mineralogical Record 36(1), 87-101. Overstreet, William C., 1967, The Geologic Occurrence of Monazite, United States Geological Survey Professional Paper, Volume 530, p. 292. Breiter, K. et al. (2007): Mineralogy and Petrology, 91, 225-248. Štemprok, M., Pivec, E., & Langrová, A. (2005). The petrogenesis of a wolframite-bearing greisen in the Vykmanov granite stock, Western Krušné hory pluton (Czech Republic). Bull. Geosci, 80(3), 163-184. Miloš René und Radek Škoda (2011): Nb-Ta-Ti oxides fractionation in rare-metal granites: Krásno-Horní Slavkov ore district, Czech Republic. Mineralogy and Petrology 103, 37-48. Chládek Š., Zimák J. (2016): Asociace Nb-Ta-(Ti-REE) oxidických minerálů v pegmatitu Maršíkov - Lysá hora v Hrubém Jeseníku, Česká republika. Bulletin mineralogicko-petrologického oddělení Národního muzea v Praze 24, 1: 25-31. Pavlíček V. et al. : Pegmatit beryl-kolumbitového typu ze Šejb v Novohradských horách. Zprávy o geologických výzkumech v roce 2008, Mineralogie, petrologie a geochemie, 185-189. Welser, P. et al. : Lithný pegmatit Nová Ves. Minerál, Special volume, 2007, roč. 15. Novák, M.: Ferrocolumbit z beryl-columbitového pegmatitu v Kostelním Vydří u Telče, západní Morava. Acta Musei Moraviae, Scientiae naturales, 1994, roč. 79, s. 3 - 8. Novak, M., Sejkora, J., & Cooper, M. A. (2000). Cyrilovite from Cyrilov, western Moravia, Czech Republic; new data on the type material. Journal of GEOsciences, 45(1-2), 101-106. Novák, M.: Niobový a tantalový rutil – hojné variety rutilu. Minerál, 2004, roč. 12, č. 6, 428-431.; Novák, M., Johan, Z., Škoda, R., Černý, P., Šrein, V., & Veselovský, F. (2008). Primary oxide minerals in the system WO3–Nb2O5–TiO2–Fe2O3–FeO and their breakdown products from the pegmatite No. 3 at Dolní Bory-Hatě, Czech Republic. European Journal of Mineralogy, 20(4), 487-499. Novák, M., Houzar, S., Pfeiferová, A.: Přehled mineralogie, petrografie a historie klasické lokality lepidolitového pegmatitu v Rožné u Bystřice nad Pernštejnem, západní Morava. Acta Musei Moraviae, Sci. geol., 83:3-48.; Novak, M., & Cerny, P. (2001). Distinctive compositional trends in columbite-tantalite from two segments of the lepidolite pegmatite at Rozna Western Moravia, Czech Republic. Journal of GEOsciences, 46(1-2), 1-8. Cerny, P., Novak, M., Chapman, R., & Masau, M. (2000). Subsolidus behavior of niobian rutile from Vezna, Czech Republic: A model for exsolutions in phases with Fe2+>> Fe3+. Journal of GEOsciences, 45(1-2), 21-35. Blomstrand, G. W., 1866, Journal fur Praktische Chemie, v. 99, p. 41. Wall, F., Williams, C. T., Woolley, A. R., & Nasraoui, M. (1996). Pyrochlore from weathered carbonatite at Lueshe, Zaire. Mineralogical Magazine, 60(402), 731-750. Raslan, M. F., El-Shall, H. E., Omar, S. A., & Daher, A. M. (2010). Mineralogy of polymetallic mineralized pegmatite of Ras Baroud granite, Central Eastern Desert, Egypt. Journal of mineralogical and petrological sciences, 105(3), 123-134. Raslan, M. F., & Ali, M. A. (2011). Mineralogy and mineral chemistry of rare-metal pegmatites at Abu Rusheid granitic gneisses, South Eastern Desert, Egypt. Geologija, 54(2), 205-222. Küster, D. et al. (2009): Mineralium Deposita 44, 723-750. Lahti, Seppo & Kärkkäinen, Niilo 2016. Esiselvitys: REE-mineraalien esiintyminen Etelä-Suomen graniiteissa ja graniittipegmatiiteisssa. Geologinen Tutkimuskeskus raportti28/2016. Hytönen, Kai 1999. Suomen Mineraalit. Geologian tutkimuskeskus. Erillisjulkaisu. Ilkka Mikkola collection. Pavel Kartashov identification. Ilkka Mikkola collection, microprobe Anton Pilipiuk. Harlaux, M., Marignac, C., Cuney, M., & Mercadier, J. (2015, August). The Puy-les-Vignes breccia pipe (Massif Central, France): a unique occurrence of polymetallic W-Nb±Ta-HREE-Bi-Cu-As±Au-Ag mineralization in the Variscan belt. In 13th Biennial SGA Meeting (Vol. 2, pp. 749-752). MONCHOUX P., FONTAN F., DE PARSEVAL P., MARTIN R. F., WANG R. C. (2006) - Igneous albitite dikes in orogenic lherzolithes, Western Pyrénées, France: A possible source for corundum and alkali feldspar xenocrysts in basaltic terranes. I. Mineralogical Asssociations. The Canadian Mineralogist, Vol. 44, pp. 817-842. Harald G. Dill and Radek Skoda (2015) The new Nb–P aplite at Reinhardsrieth: A keystone in the lateral and depth zonations of the Hagendorf–Pleystein Pegmatite Field, SE Germany. Ore Geology Reviews 70:208–227. Dill, H.G. (2009) The Hagendorf-Pleystein phosphate pegmatites (NE Bavaria, Germany) - A mineralogical, chronological and sedimentological overview. Estudos Geológicos: 19(2): 117-120. Dill, H. G., Weber, B., Gerdes, A., & Melcher, F. (2008). The Fe-Mn phosphate apliteSilbergrube'near Waidhaus, Germany: epithermal phosphate mineralization in the Hagendorf-Pleystein pegmatite province. Mineralogical Magazine, 72(5), 1119-1144. AA. VV., 1996. Collezionare minerali. Hobby & Work. ; Guastoni, A., Pozzi, G., Secco, L., Schiazza, M., Pennacchioni, G., Fioretti, A. M., & Nestola, F. (2016). Monazite-(Ce) and Xenotime-(Y) From An Lct, NYF Tertiary Pegmatite Field: Evidence From A Regional Study In the Central Alps (Italy and Switzerland). The Canadian Mineralogist, 54(4), 863-877. Vecchi, F., Rocchetti, I. & Gentile, P. (2013): Die Mineralien des Granits von Predazzo, Provinz Trient, Italien. Mineralien-Welt, 24(6), 98-117 (in German). C. Aurisicchio, C. De Vito, V. Ferrini, P. Orlandi (2002) - Nb and Ta oxide minerals in the Fonte Del Prete granitic-pegmatite dike, island of Elba, Italy - Canadian Mineralogist, 40: 799-814. Nakajima & Kurosawa (2006), Canadian Mineralogist: 44: 40-41. Kazuo Nakashima and Teruyoshi Imaoka (1998) Mineralogy and Petrology, 63, #1-2, 1-17. Ranorosoa, N. (1986): Etude mineralogique des pegmatites du champ de la Sahatany, Madagascar. These de Doctorat de l`Universite Paul Sabatier, Toulouse Toulouse 3, no. 86 TOU3 0210, Toulouse, 240 p.
Favreau, G. (2012): Deux pegmatites à phosphates de Sidi Bou Othmane (Maroc). Le Cahier des Micromonteurs, 3-2012, 71-109. - Bezing, L. von, Bode, R. & Jahn, S. (2007): Namibia. Mineralien und Fundstellen. Edition Schloss Freudenstein, Bode Verlag, Haltern, 411 pp. (in English) ; Ashworth, L. (2014). Mineralised Pegmatites of the Damara Belt, Namibia: Fluid inclusion and geochemical characteristics with implications for post-collisional mineralisation (Doctoral dissertation, Faculty of Science, University of the Witwatersrand). Von Bezing, L., Bode, R., and Jahn, S., (2008) Namibia Minerals and Localities. Edition Schloss Freudenstein, Bode Verlag GmbH, Haltern. 543 pp (in English). ; Keller, P. (1991) The occurrence of Li-Fe-Mn phosphate minerals in granitic pegmatites of Namibia. Communications of the Geological Survey of Namibia, 7, 21-35. Selbekk, R.S., Berg, H.-J.,Folvik, H. & Ellingsen, H.V. (2008): Mineraler i columbitt-tantalittgruppen fra Norge. Norsk Bergverksmuseum Skrift. 38, 33-36. Larsen, A. O. (2001): Ein Neufund für Norwegen: Fersmite vom Pegmatite "Landsverk 1" bei Evje. Mineralien-Welt, no 3, pp. 48-50. Lund, M. (2016) Columbite-tantalite and garnet geochemistry in Evje-Iveland, south Norway. master Thesis in Geosciences, University of Oslo. 156p. Selbekk, R.S., Berg, H.-J.,Folvik, H. & Ellingsen, H.V. (2008): Mineraler i columbitt-tantalittgruppen fra Norge. Norsk Bergverksmuseum Skrift 38, 33-36. PIECZKA et al. 2010: Nb-Ta minerals in pegmatites in the DSS mine at Piława Górna, Góry Sowie Block, southwestern Poland. Mineralogia - Special Papers, 37. Antunes, I. M. H. R., Neiva, A. M. R., Ramos, J. M. F., Silva, P. B., Silva, M. M. V. G., & Corfu, F. (2013). Petrogenetic links between lepidolite-subtype aplite-pegmatite, aplite veins and associated granites at Segura (central Portugal). Chemie der Erde-Geochemistry, 73(3), 323-341. Sorokina, E. S., Koivula, J. I., Muyal, J., Karampelas, S., Nishanbaev, T. P., & Nikandrov, S. N. (2016). Multiphase fluid inclusions in blue sapphires from the Ilmen Mountains, southern Urals. Gems & Gemology, 52(2), 209-211. Iovchev E.S., Kul'tiasov S.V., Pyatnov V.I. Khlopinites in Zaganskii range pegmatites, - Mineral'noe syr'ye, 1937, N9, p.6-15. Victor V. Sharygin analytycal data (2012); Sharygin, V. V., & Vladykin, N. V. (2014). Mineralogy of cryolite rocks from the Katugin massif, Transbaikalia, Russia. Abstract Book of 30th International Conference on “Ore Potential of Alkaline, Kimberlite and Carbonatite Magmatism,” Antalya, Turkey, 166-168.; Savel’eva, V. B., Bazarova, E. P., Khromova, E. A., & Kanakin, S. V. (2017). Fluorides and Fluorcarbonates in Rocks of the Katugin Complex, Eastern Siberia: Indicators of Geochemical Mineral Formation Conditions. Geology of Ore Deposits, 59(7), 561-574. Atencio, D., Bastos Neto, A.C., Pereira, V.P., Ferron, J.T.M.M., Hoshino, M., Moriyama, T., Watanabe, Y., Miyawaki, R., Coutinho, J.M.V., Andrade, M.B., Domanik, K., Chukanov, N.V., Momma, K., Hirano, H., Tsunematsu, M. (2015): Waimirite-(Y), orthorhombic YF3, a new mineral from the Pitinga mine, Presidente Figueiredo, Amazonas, Brazil and from Jabal Tawlah, Saudi Arabia: description and crystal structure. Mineralogical Magazine, 79, 767-780. Chudík P., Uher P., Gadas P., Škoda R., Pršek J., 2011: Niobium-tantalum oxide minerals in the Jezuitské Lesy granitic pegmatite, Bratislava Massif, Slovakia: To to Nb and Fe to Mn evolutionary trends in narrow Be, Cs-rich and Li, B-poor dike. Mineralogy and Petrology, 101, Special Issue: Accessory Minerals. Uher P., Černý P., Novák M., Siman P., 1994: Niobium-tantalum minerals from granitic pegmatites in the Malé Karpaty, Považský Inovec and Žiar Mountains, Western Carpathians, Slovakia. Mineralia Slov., 26, 157-164. Uher, P., Žitňan, P. & Ozdín, D. (2006) Compositional Variations Of Pegmatite Nb-ta Mineral Assemblage From The Limbach Area, Malé Karpaty Mts., Slovakia. Acta Miner.-Petrograph.,Abstract Series 5, Szeged, p.125; Uher, P., & Zitnan, P. (2007). Pegmatitic Nb-Ta oxide minerals in alluvial placers from Limbach, Bratislava Massif, Western Carpathians, Slovakia: compositional variations and evolutionary trend. Journal of Geosciences, 52(1-2), 133-141. Uher, P.: Columbit-tantalit z pegmatitu při Ráztočne v pohorí Žiar (stredné Slovensko). Bulletin mineralogicko-petrografického oddělení Národního muzea v Praze, 2008, vol. 16, 1, 109-112. Calvo, M. (2009): Minerales y Minas de España. Vol. IV, Óxidos e Hidróxidos. Escuela Técnica Superior de Ingenieros de Minas de Madrid - Fundación Gómez Pardo. 752 pp; Encarnación Roda-Robles, Alfonso Pesquera (2007) Locality no. 4: The Phosphates-Rich Cañada Pegmatite (Aldehuela de La Bóveda, Salamanca, Spain) in ALEXANDRE LIMA & ENCARNACIÓN RODA ROBLES ed (2007) GRANITIC PEGMATITES: THE STATE OF THE ART - FIELD TRIP GUIDEBOOK. MEMÓRIAS N. º 9, UNIV. DO PORTO, FACULDADE DE CIÊNCIAS, DEPARTAMENTO DE GEOLOGIA pp 67-72. Stalder, H. A., Wagner, A., Graeser, S. and Stuker, P. (1998): "Mineralienlexikon der Schweiz", Wepf (Basel), p. 156. Stalder, H. A., Wagner, A., Graeser, S. and Stuker, P. (1998): "Mineralienlexikon der Schweiz", Wepf (Basel), p. 314. Stalder, H. A., Wagner, A., Graeser, S. and Stuker, P. (1998): Mineralienlexikon der Schweiz. Wepf (Basel), p. 123. Guastoni, A., Pennacchioni, G., Pozzi, G., Fioretti, A. M., Walters, J.M. (2014) Tertiary pegmatite dikes of the Central Alps. The Canadian Mineralogist, 52, 2, 191-219. Eur. J. Mineral. , 1993, 5, pp. 721-736. Lyckberg, P., Chornousenko, V. & Wilson, W. E. (2009): Volodarsk-Volynski, Zhitomir Oblast, Ukraine. 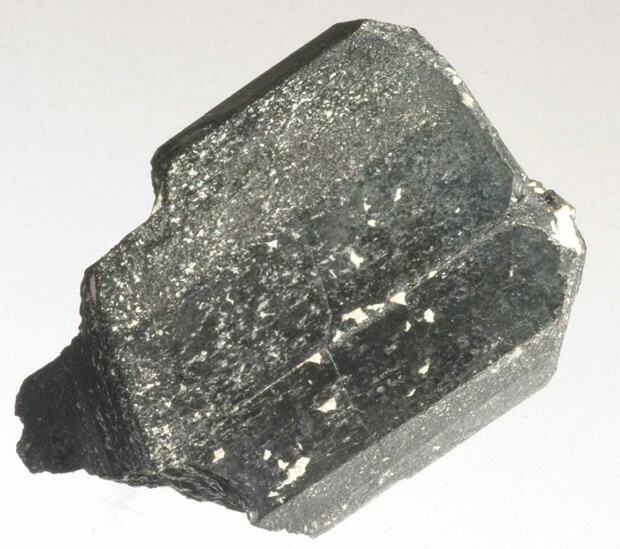 Mineralogical Record, 40, 473-506.; Bailey, J. C: Formation of cryolite and other aluminofluorides: A petrologic review. Bull. geol. Soc. Denmark, vol. 29, pp. 1-45. Copenhagen, June 10th, 1980. Anthony, J.W., et al (1995), Mineralogy of Arizona, 3rd.ed. : 221. Phil Osborn collection, circa 1981. Jahns, R. H. and Wright, L. A. (1951), Gem and Lithium-bearing pegmatites of the Pala District, San Diego County, California. California Division of Mines special report 7A: 39. Meeves, H., et al (1966), Reconnaissance of beryllium-bearing pegmatite deposits in six western states, US Bur. Mines Info. Circ. 8298: 26 (Table A-1); Rocks & Min. : 24:233-234. Januzzi.(1976). Mineral Localities of CT and Southeastern NY State; Cameron et al (1954). USGS Prof Paper 255. Davis, Fred E. and Stefan Nicolescu. (2011): Samarskite Rediscovered at the Spinelli Prospect, Glastonbury, Connecticut. Bulletin of the Peabody Museum of Natural History: 52(1):135-152; Albini, A.J. and Moritz, H. (2013), Collecting samarskite at the historic Spinelli prospect, Glastonbury, Hartford County, Connecticut. The 40th Rochester Mineralogical Symposium, Contributed Papers in Specimen Mineralogy, 8. Elwell, Wilbur. (1937): Some Old Localities in Connecticut. Rocks and Minerals, vol 12, no. 9, pp. 270-1. Torrey, John (1822a), Tantalite in Haddam rocks. American Journal of Science: s. 1: 4: 52.; Torrey (Torry), John (1824), An Account of the Columbite of Haddam (Connecticut). The Annals of Philosophy: 8(24): 359-362.; Shepard, Charles U. (1837), Report on the Geological Survey of Connecticut. Hamlem, New Haven. Hunt, T. S. (1852): Examination of some American Minerals. American Journal Of Science: s. 2: 14: 40-1. Mineralogical Record 23:19-28,80; Mineralogical Magazine 1902 13 : 97-121. Montague, S. A. (1937): Some Mineral Localities Near Portland, Conn. Rocks & Minerals: 12 (5): 145.; Ingerson, Earl. (1938): Uraninite And Associated Minerals From Haddam Neck, Connecticut. American Mineralogist: 23 (4): 269-276. John F. Schairer (1931) Minerals of Connecticut. State Geological and Natural History Survey Bulletin No. 51. Cameron, Eugene N., Larrabee David M., McNair, Andrew H., Page, James T., Stewart, Glenn W., and Shainin, Vincent E. (1954), Pegmatite Investigations 1942-45 New England. USGS Professional Paper 255. Rocks & Min. : 12:145.; Hanson, S., Jarnot, B. M., Falster, A. U., Simmons, W. B., and Nizamoff, J. W., 2003, Nb-Ta-Ti Oxide Minerals from Two Pegmatites of the Middletown Area, Connecticut, Program with Abstracts, v.30, p. 11. - Seaman, David. (1963): The Walden Gem Mine. Rocks and Minerals, Vol. 38, Nos. 7-8, Whole No. 295, p. 355-62. King, V. and Foord, E., 1994, Mineralogy of Maine, v.1. ; Cameron, Eugene N.; and others (1954) Pegmatite investigations, 1942-45, in New England. USGS Professional Paper 255. Morrill, P. and a Lot of Other People, 1958, Maine Mines, v. 1. King, V. T., 2009, Maine Feldspar, Families, and Feuds, book in press. ; King, V., 2008, Maine Feldspar, Families, and Feuds. King, V. (ed), 2009, Maine Feldspar, Families, and Feuds. King, V. T., 2008, Maine Feldspar, Families, and Feuds. http://coromotominerals.com/index.html; SEM-EDS analysis of the ferrocolumbite; King, V. and Foord, E., 1994, Mineralogy of Maine, V. 1. Falster, A.U., Simmons, W.B., Sprague, R. (2006) 33rd Rochester Mineralogical Symposium, abstracts, 14-15. King, V., 2000, Mineralogy of Maine, volume 2. Wise, Michael A.; Brown, Cathleen D. (2011): Chemical composition of coexisting columbite-group minerals and cassiterite from the Black Mountain pegmatite, Maine. Eur. J. Mineral. 23, 817-828. "Maine Mineral Localities, 3rd Ed." by Thompson, W.B., et.al., 1998; Bastin, Edson Sunderland (1911) Geology of the pegmatites and associated rocks of Maine, including feldspar, quartz, mica, and gem deposits. USGS Bulletin 445. [www.johnbetts-fineminerals.com]; Cameron, Eugene N.; and others (1954) Pegmatite investigations, 1942-45, in New England. USGS Professional Paper 255. King & Foord, 1994. Mineralogy of Maine, V. 1.; King and Foord, 2000, Addenda to Volume 1, Mineralogy of Maine, v. 2.; Bastin, Edson Sunderland (1911) Geology of the pegmatites and associated rocks of Maine, including feldspar, quartz, mica, and gem deposits. USGS Bulletin 445. King, V. and Foord, E., 1994, Mineralogy of Maine. ; Cameron, Eugene N.; and others (1954) Pegmatite investigations, 1942-45, in New England. USGS Professional Paper 255. King, V.T., 1994, Mineralogy of Maine, Descriptive Mineralogy, v.1. Mineralogy of Michigan (2004) Heinrich & Robinson; Buchholz, T.W., A.U. Falster & W.B. Simmons (2014), Accessory Mineralogy of an Evolved Dickinson County, Michigan, Pegmatite, a presentation before the 41st. Rochester Mineralogical Symposium, April 25, 2014. Buchholz, T.W., Falster, A.U. and Simmons, W.B. (2013) Accessory mineralogy of the Black River pegmatite and Humboldt granite, Marquette County, Michigan. The 40th Rochester Mineralogical Symposium, Contributed Papers in Specimen Mineralogy, 9-10. Gobla, M.J. (2012) Montana mineral locality index. Rocks & Minerals, 87, #3, 208-240; Chris Tucker and John Betts specimens. ; Gobla, M. J. (2012) Montana Mineral Locality Index. Rocks and Minerals 87:208-240. Rocks & Minerals (1990): 65: 295. Camp, Kristen F. (2011), "Mineralogy and Geochemistry of Anorogenic Granitic Miarolitic Pegmatites Associated with the White Mountain Intrusive Suite, New Hampshire." University of New Orleans Theses and Dissertations. Paper 1363. Roberts, Bill, Minerals of the Black Hills. Rocks & Min. : 8:143-144.; Richards, R. P., Kearns, L. E., & Cook, W. R. (1998). Morphology of Chiolite twins from the Morefield mine, Amelia County, Virginia. Canadian mineralogist, 36, 1009-1016. Buchholz, T. W., Falster, A. U. & Simmons, W B. (2002), Minerals of the Ladick East Quarry, Marathon County, Wisconsin:Rocks and Minerals: 77 (3): 169. Buchholz, T. W., A. U.Falster, and W. B. Simmons (2012) Mineralogy Of An Unusual Pegmatite, Stettin Pluton, Marathon County, Wi. 39th Rochester Symposium abstracts. Buchholz, T.W., Falster, A.U., Simmons, W.B. (2006) 33rd Rochester Mineralogical Symposium, abstracts, 18-19.